Preheat oven to 350 degrees. Butter a square 8 x 8 baking dish. Blend all the ingredients in a food processor for about 3-5 minutes until corn is nicely blended while still retaining some texture. Pour into baking pan and bake until golden brown, about 35-45 minutes. Cool and serve warm as a side or as dessert. My friend David Moore asked me to cook up a casual dinner, saying "In the interest of this being an heirloom meal, I thought you should make corn pudding." I said, no problem. 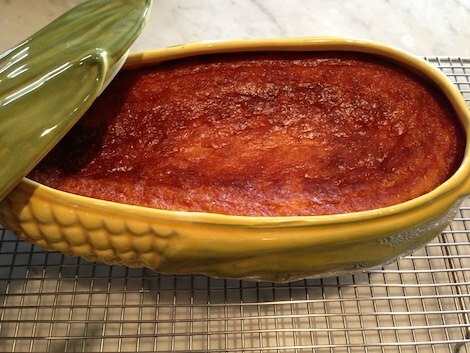 So I googled corn pudding, printed a couple of recipes and then adapted them into my own. I thought I was making DESSERT! You can only imagine how surprised I was when David put the corn pudding on the table. I proclaimed, "Shouldn't we wait until after the main course?" To which David responded, "It is part of the main course." And I burst out laughing, admitting I thought it was dessert and I even made whipped cream to go on top! And boy was it delicious. This is a keeper and I was told it was better than his Dad's!